On 14th September 2014 a team of four from Thompson Smith and Puxon will be taking part in tandem sky-dive in aid of the Dame Vera Lynn Trust (Charity No.1089657). 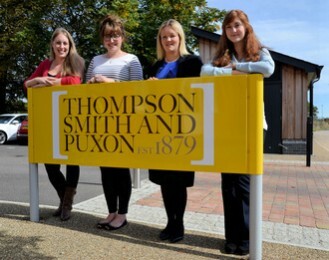 The team, (pictured outside the TSP Colchester office) comprises Wills and Estates solicitor, Lisa Montgomerie, Juliette Morris, who deals with TSP’s IT, Ellie Harries, who works in the Marketing and Business Development team, and Wills and Estates secretary, Sophie Howe. Securely harnessed to their skydiving instructors, the team will be jumping from 13,000ft (approx. 2 miles high) and will reach speeds of over 120mph as they freefall to around 5,000ft before their instructor opens the chute. Once the chute has been deployed they will be guided through a 7 minute canopy ride before returning safely to firm ground. The team hopes to raise a minimum of £1200 between them, a proportion of which will go towards the cost of the jump, whilst the remainder goes directly to the charity. TSP has donated £50 to each team member, getting them off to a great start towards their target! The Dame Vera Lynn Trust provides a specialist service for families of young children with cerebral palsy and other motor learning difficulties. Families attend one session a week at the Trust’s School for Parents. Parents are taught to recognise their child’s unique qualities and achievements and are able to talk openly to each other about their child’s activities and share an understanding of each other’s situation. The emphasis is to provide strong practical support for all parents who have children with special needs in a sympathetic environment. All of their services are provided to families free of charge. They receive no statutory funding and rely entirely on the support of the community to raise the funds to ensure that this vital and much needed service continues.